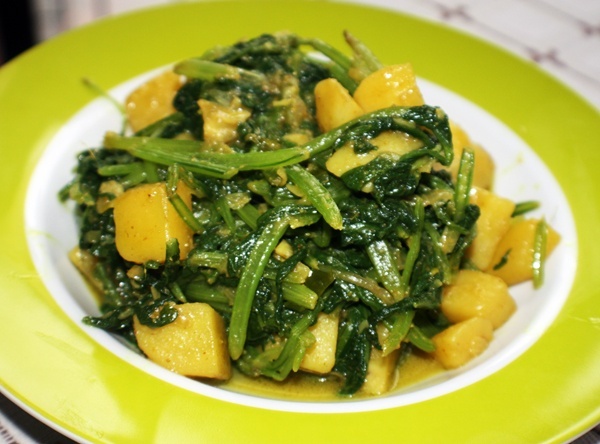 Potatoes and Spinach leaves also know as Aloo Saag is a tasty and easy side dish with any meal. Spinach is high in fiber and aids in digestion and helps to maintain low blood sugar. A tasty way to eat your greens. Serve it with Roti or Partha. Wash the spinach leaves and drain them properly so that there is no water left in the leaves. Chop the spinach and keep aside. Heat Oil in a pan over medium heat and fry the onions, ginger, garlic and chillies for about 2 mins. Add the spinach leaves to the potatoes and cook for another 3-5 mins. The leave should on be over cooked. Sprinkle garam masala and serve with Rotis. This entry was posted in All Recipes, Vegetables and tagged Aloo Saag, Greens by Kamakshi. Bookmark the permalink.